During this four day Immersion you will be going on daily Forest Therapy walks. On these walks you will be invited to use your heart, mind and hands to partner with nature to to explore the expressive arts. You will be using all of your senses, especially the heart sense to notice and honor a sense of place and to develop a deeper connection with the natural world. This connection can then inspire you to create art which could be a kind of narrative, beyond words, of your personal connection with the natural world. We make an ephemeral connection with earth art when we build a snowman or sandcastle; carve a Halloween pumpkin or decorate easter eggs. Such art is often considered child’s play while ‘serious’’ art for adults is often housed in galleries and museums. In the 1960’s and 70’s, however, we developed more environmental awareness. The Land Art Movement began which connected art with the natural world. Some artists leading this movement, and working on a large scale, were Andy Goldsworthy, Robert Smithson, Steve Tobin, and Nils-Udo. The land art movement (Tiberghien 1995; Kastner 1998) explores the aesthetic and reconnective power of art as it is embedded in the landscape. This art makes art out of raw materials of the natural space where it takes place and can be seen in the works of artists such as Andy Goldsworthy (2004). Goldsworthy’s aesthetic could be described as a deep connection and understanding of natural space and place and how art can interweave with nature to represent a narrative of a living space. Art here represents a pictorial narrative beyond just words and is an attempt to develop a language of human-nature relationships embodied in visual forms. This course is designed for forest therapy guides who want to incorporate more art-based invitations into the walks they guide, It will also be relevant to those interested in ecotherapy, art therapy, and ephemeral land-based art using found objects. When Joy Morton established The Morton Arboretum in 1922, he envisioned a “great outdoor museum” of trees. Today, our living collections inspire visitors to appreciate, learn about, plant, and protect trees. The Arboretum champions the world's trees through scientific study, conservation, education, and outreach. The Arboretum offers extensive educational programming for all ages; conducts leading research on tree health and tree improvement; breeds and introduces hardy and disease-resistant trees and shrubs for distribution throughout the Midwest; and presents nature-related activities year-round for people of all ages and interests. Also on the grounds are the Visitor Center and Plant Clinic, The Arboretum Store, Ginkgo Restaurant and Café, four-acre Children’s Garden, one-acre Maze Garden, an environmentally-friendly parking lot, and a paved walking trail around restored Meadow Lake. All prices USD; Tuition does not include lodging and meals. Brenda Spitzer is a Forest Therapy Guide for The Association of Nature and Forest Therapy Guides and Programs. She trained and was certified with Cohort 3 in 2015. She also has a Bachelor of Arts in Art from Northern Illinois University and Certificates in Botanical art and Illustration and Natural History from The Morton Arboretum. 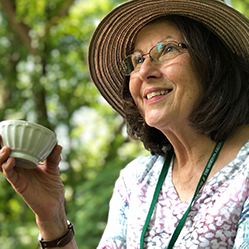 She introduced the “NatureRX: Forest Therapy Walk” program at The Morton Arboretum in 2016, and has been guiding forest therapy walks at that location for the past 3 years. She also guides walks for The Western Reserve Special Recreation Association.